Kefalonia Greece Eating In Kefalonia. 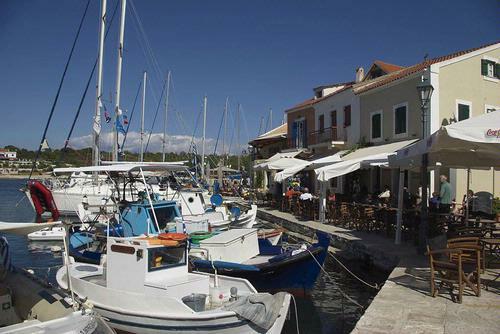 There are lots of restaurants and tavernas overlooking the harbours in the main towns and villages. Those who enjoy good food will not be disappointed in Kefalonia. The numerous Tavernas and restaurants offer traditional Kefalonian fare. Fresh fish caught by local fisherman is a speciality. Fish on the Menu may seem expensive but it is priced by the Kilo so each portion is weighed and separately priced on your final Bill. Not to be missed dishes include the tasty Kreatopita, which is meat pie made with local lamb and rice. Aliadha which is a local garlic pasta made with potatoes and Bakaliaropita which is a Cod pie. A local speciality are Mandoles which are sweets made of caramel and almonds. The local wines are excellent (see wines page) and are a fit accompaniment to any meal. The main square in Argostoli is surrounded by restaurants and is thronged in the evenings. There are too many to mention individual eateries. Every town and village has its eating places some producing high quality local food and others more basic fare. An excellent guide book describing many of these restaurants and tavernas and also suggested walks is Walk and Eat Kefalonia by Brian & Eileen Anderson which is available through our on line store. Stock breeding on the island specializes in the Kokkino or red sheep and the Cephallonikito or Kefalonian sheep. The island offer good fresh meat and tasty local cheeses, the best known being Feta and Kefalotyri. For those self catering, the islands fish and fruit and vegetable markets are in Argostoli, both being found on the sea front. A wide variety of fish and produce are available.